When one thinks of Mercedes-Benz, one usually thinks of sleek sedans and sports cars built for taking one around the city in style – to the theatre or to a classy café or maybe a craft brewery (very German!). One doesn’t usually think about getting stuck in off the road where things get rugged and tough. If this rings true for you, then you’re in for a surprise with the Mercedes-Benz G-Class Professional. However, you shouldn’t really be surprised that Merc is capable of producing a serious bush-basher that can just about go anywhere that something with wheels can go. After all, Mercedes-Benz have been producing tough trucks and buses for ages, and it’s not such a big step from that to 4x4s. The Mercedes Benz G-Class Professional (sometimes called the GProfessional) is not some silly softroader that has a bit of ground clearance and optional AWD but spends most of its time in the city. Instead, the Mercedes Benz G-Class Professional does what it says on the label: this is a no-nonsense off-roader designed for men and women who have to drive in the middle of nowhere over rough terrain as part of the job. The Professional can and has been used by the military, and it would also be suitable for Outback touring, search and rescue operations and park rangers. Not that any dealer will only sell you a Mercedes Benz G-Class Professional if you need this level of 4×4 for your rugged outdoor job – if you like to off-road as a hobby now and again, you’ll probably love the Mercedes Benz G-Class Professional as well. A vehicle has to be built right if it’s to hack it out in the great outdoors which have never seen even a smidgeon of bitumen. 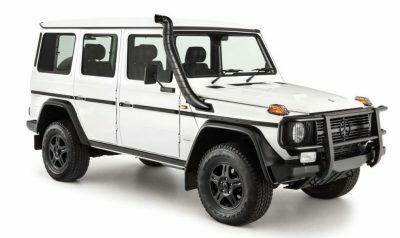 The Mercedes Benz G-Class Professional wagon certainly looks as though it’s got what it takes, with classic boxy 4×4 styling, and black bull bars and a black snorkel coming as standard features, as do stone guards on the headlights and indicators (but not on the fog lights), towing eyes front and rear, and bottom guards on the radiator and oil sump). It’s about as far as it can get from those sleek sedans that also bear the Mercedes-Benz badge. In fact, the Mercedes Benz G-Class Professional almost looks odd if it doesn’t have a bit of dirt and dust somewhere on the paint. Speaking of paint, the selection available is quite wide, ranging from more muted shades like black, white, brown and green through to more vivid tones like orange, blue and red (the orange one will blend nicely with the dust in the Red Centre!). Winch preparation is available as an option. OK, so the Mercedes Benz G-Class Professional looks the part. It also has the actual dimensions and capabilities to back up the looks. The ground clearance in this full-time 4×4 is 230 mm, which helps it have an approach angle of 38°, a departure angle of 42° and a break-over angle of 23°. That elephantine snorkel means that you can go through water 600 mm deep (for goodness sake, keep an eye out for salties in croc country!). The slope climbing ability is 60% and the maximum lateral slope the Mercedes Benz G-Class Professional can cope with is 40%. Diff locks are fitted front, centre and rear, and the five-speed automatic transmission has high and low gearing (ratio for high: 0.87; ratio for low gear: 2.16). Both the low gearing and all of the differential locks can be selected while on the move, which is handy for getting out of sticky situations. The unit that keeps all this ticking over is a 3-litre V6 diesel with masses of torque right down low where you need it: 400 Nm in the 1600–2600 rpm range (and 135 kW of power). This should be enough for most situations, including towing. The Mercedes Benz G-Class Professional can tow up to 3140 kg braked weight, which is a fraction over three tonnes and is enough to tow a smallish Asian elephant or a hippopotamus (if the elephant or the hippo has the necessary brakes). The Mercedes Benz G-Class Professional can also take a one-tonne payload, but probably not at the same time. The fuel tank size is 96 L, which should last you a long time, depending on how you drive it (take a spare jerrycan just in case if you’re going a long way off the beaten track). Inside the Mercedes Benz G-Class Professional, there’s certainly plenty of room to store everything – and there’s walk-through access from the cabin (there’s seating for four) to the luggage compartment. You’ll also find places to put things under the front seats as well as in luggage nets behind the front seats and pockets in the front doors. The standard seat trim is a fun tartan cloth in black and white. Given where the Mercedes Benz G-Class Professional is likely to be driven, the designers haven’t bothered with a lot of the driver aids that you’ll find in the more citified Mercs – you don’t need lane departure warning when there are no lanes. However, you’ll get power steering, air con and an electronic stability program with ABS brakes with Brake Assist and EBD. I guess you could call the dirty air filter warning a driver aid, as the Mercedes Benz G-Class Professional is more likely to encounter too much dust rather than too much traffic, if it’s driven in the extreme conditions it’s designed for. Of course, if you want an interior that isn’t quite as Spartan, you can go up to the Mercedes Benz G-Class Professional Edition Pur. This comes with different exterior paint colours and seats upholstered in black leather – and a walk-on bonnet that takes up to 100 kg and roof rails as standard. This has heated front seats and a radio/CD audio system (in the basic version, you get preparation for a 12-V radio, so you’ll have to plug something into the 12-V socket in the dash if you want music while you camp out). For any more information on the Mercedes Benz G-Class Professional, or for that matter any other new car, contact one of our friendly consultants on 1300 303 181. If you’d like some fleet discount pricing (yes even for private buyers! ), we can submit vehicle quotes requests out to our national network of Mercedes Benz dealers and come back with pricing within 24 hours. Private Fleet – car buying made easy!